Previously published as What's Eating Your Child? 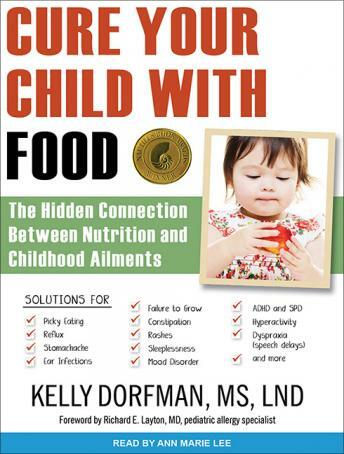 and now with a new chapter on the unexpected connection between gluten and insatiable appetite, Cure Your Child with Food shows parents how to uncover the clues behind their children's surprisingly nutrition-based health issues and implement simple treatments-immediately. You'll discover how zinc deficiency can cause picky eating and affect growth; the panoply of problems caused by gluten and dairy; and how ear infections and mood disorders, such as anxiety and bipolar disorder, can be a sign of food intolerance. Plus, you'll learn how to get your child to sleep, soothe hyperactivity, and deal with reflux using simple nutritional strategies. Dorfman, a nutritionist whose typical family arrives at her practice after seeing three or more specialists, gives parents the tools they need to become nutrition detectives; to recalibrate their children's diets through the easy E.A.T. program; and, finally, to get their children off drugs-antibiotics, laxatives, Prozac, Ritalin-and back to a natural state of well-being.